Before my fellow teacher and I lead our Academic conversations Book Club (post-phoned a week due to a baby-shower) we decided to implement a few of the strategies in our own classrooms. One of the activities we are implementing in the Connect The Word Activity. 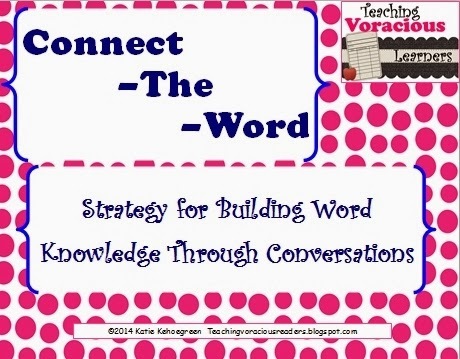 The Connect-the-Word is a vocabulary strategy and conversation starter taken from Jeff Zwiers and Marie Crawford’s book Academic Conversations: Academic Conversations: Classroom Talk that Fosters Critical Thinking and Content Understandings. The teacher chooses a key concept (democracy, photosynthesis, theme) for the center circle and then chooses four key words that relate to this concept which go in the rectangular boxes. The teacher then connects the key words using connecting phrases written on diamonds. The teacher could also leave these diamond cards blank and have the student fill these out themselves. After the graphic organizer is complete, students explain to their partner why they placed the cards in the places they did and if their partner disagrees, defend how they connected key words and diamond phrases. The point of this activity is to build students understanding of how words connect though conversation. I had some silly examples (celebrities, Olympics) and some more serious examples (SBAC, photosynthesis) for the teachers to use to practice the activity. 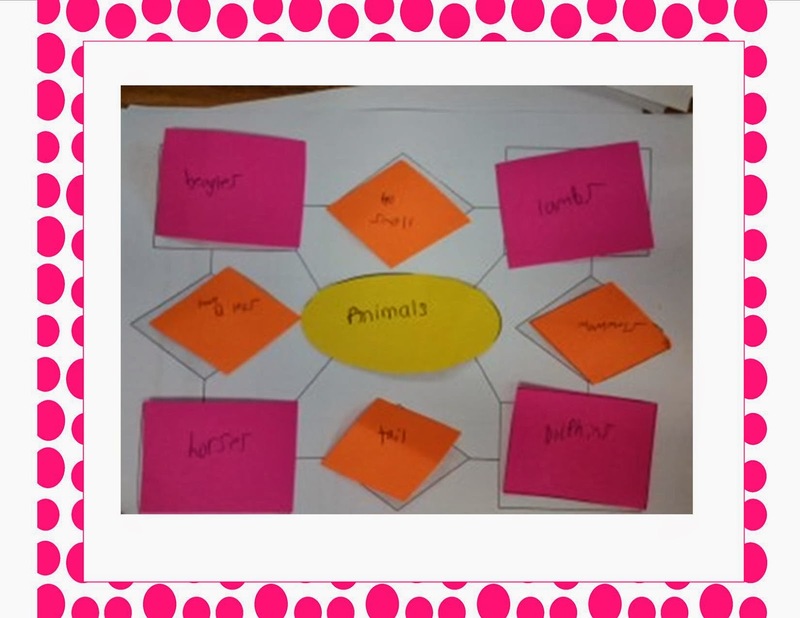 One of the implementations happened pretty naturally for me – I happened to have the supplies for the Connect the Word Card activity on the table. She saw the name Taylor Swift and asked what it was. She completed the celebrities activity fairly quickly then asked for another. I gave her the Olympics one and she wasn’t sure who everyone was (Lolo Jones, Usain Bolt) but after I gave her a pretty simple explanation (Runner and Bobsledder, Bobsledder) she was able to put the cards all in the right places. She then wanted to make her own. I did have blank cards for teachers to use so I let her use them because I was curious to see how she would create her own set of cards. I can’t lie – it took me a couple tries to make one set of cards! She chose animals, which she loves, then choose her four favorite animals: lambs, dolphins, horses, and beagles. Now I was wondering how she would connect a dolphin with the other three! She did it though and quickly (horses and dolphins both have tails, and dolphins and lambs are both mammals). The example in the Academic Conversations text was more complex, using democracy as the central term and having words like equality and freedom as key terms. My next step in this project is to create word cards for all core subject areas in a variety of grades. I think my “fun” card sets about celebrities and the Olympics help familiarize the students with the structure and process of the activity and when used in an actual larger lesson would be key to warming the students up and seeing the activity as a fun puzzle. 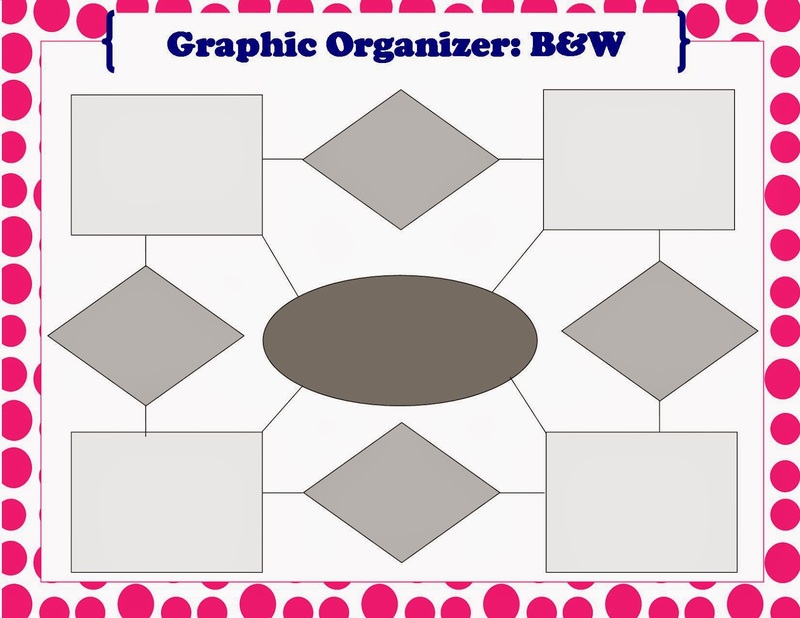 I made a TPT product for this activity which includes a description of the activity, the graphic organizer, and blank cards for you to use. I'd like to nominate you for the Sunshine Blogger Award! I always enjoy reading your ideas on your blog! Visit my blog for all of the details if you choose to accept and participate. It takes a little work, but it was fun to share about myself and get the chance to learn more about other people in this amazing teacher bloggy world! Hope you are enjoying your Spring Break! Aw! That's amazing!! Thank you so much!